The Fukien Tea is a tropical evergreen shrub originating from southern China. This plant works particularly well as a mini bonsai, but is also a great houseplant because it appreciates warm temps in the winter months making it a perfect choice for anyone in the city or who does not have the benefits of a yard. Delicate white blossom bloom almost year round and small dark green leaves are shiny with little white dots on the surfaces which are often mistaken for insect infestations. The trunk has wonderful brownish red bark which contrasts beautifully with the dark green of its leaves. Each live plant is shipped with the Phytosanitary Certificate as required by the USDA. SPECIES: Delicate white blossom bloom almost year round and small dark green leaves are shiny with little white dots on the surfaces which are often mistaken for insect infestations. The trunk has wonderful brownish red bark which contrasts beautifully with the dark green of its leaves. 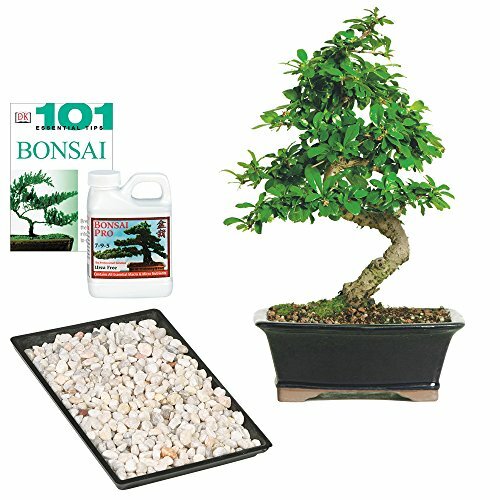 SIZE: Your medium bonsai comes in an 8" container. AGE: This Fukien Tea Bonsai is 6 years old. CARE: Indoor Care - Your order will be carefully wrapped in a custom designed corrugated carton and delivered with detailed care instructions. If you have any questions about this product by Brussel's Bonsai, contact us by completing and submitting the form below. If you are looking for a specif part number, please include it with your message. Ponytail Palm - 6" pot - Beaucarnea - Great Indoors! 1 Aralia Ming Stump Plant - 6" Pot - Live House Plant - FREE Care Guide - 2FT Tall!